Disclosure: Please note that some of the links in this port are affiliate links and I will earn a commission if you purchase through those links. I have used all the products and recomment them because they are helpful and are companies I trust, not because of the commissions that I may earn from you using those products. 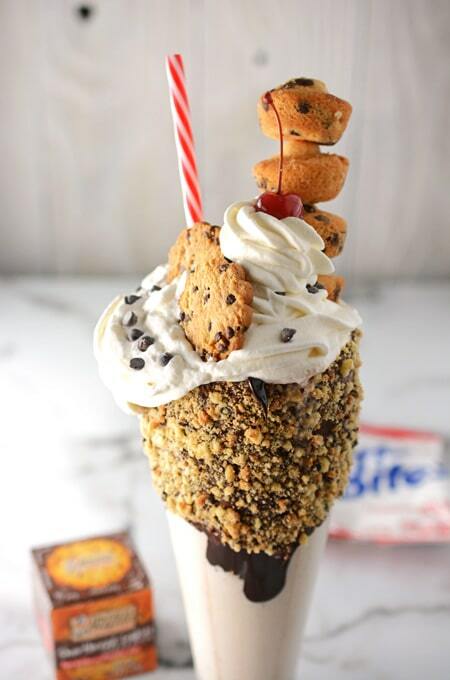 So for the last month or so I have wanted to do my own version of a monster shake or freak shake since I first saw them all over social media. 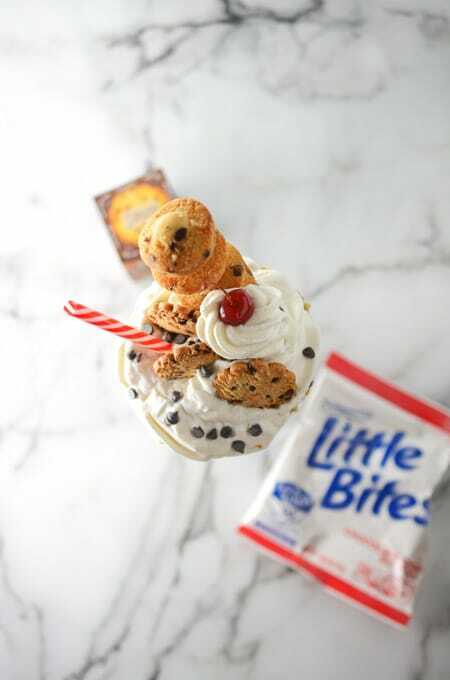 A classic old school ice cream treat with a little something extra on top….. okay a lot extra! The creative possibilities are endless. I mean with so many flavors of ice cream, and all the crazy types of candy so easily accessible now days with online shopping; I couldn’t wait to get started on my version, however with so many possibilities I didn’t know where to start. So for about a month I debated on what flavor to do, and then came my September Degustabox! Once I saw Entenmann’s Chocolate Chip Mini Muffins and Michel et Augustin’s Little Chocolate Chip Shortbread Cookies I knew! 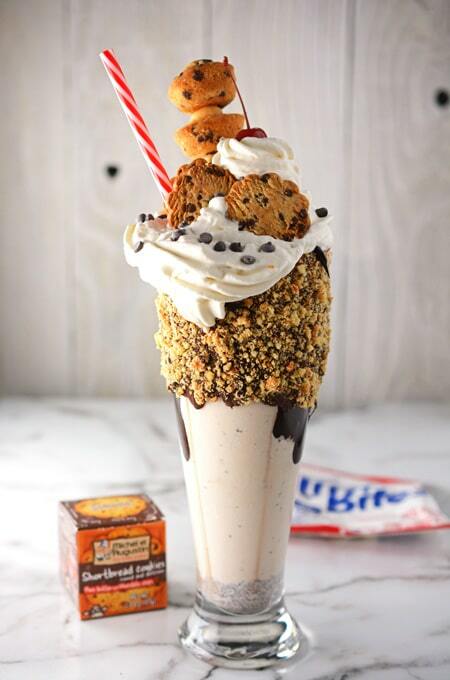 The Chocolate Chip Monster Milkshake was born. 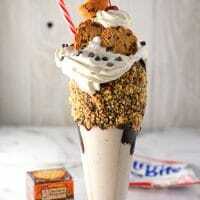 This Chocolate Chip Monster Milkshake is super easy to make; and incredibly easy to make your own by choosing your favorite flavor of ice cream and letting your imagination run wild for your garnishes. The sky is the limit! 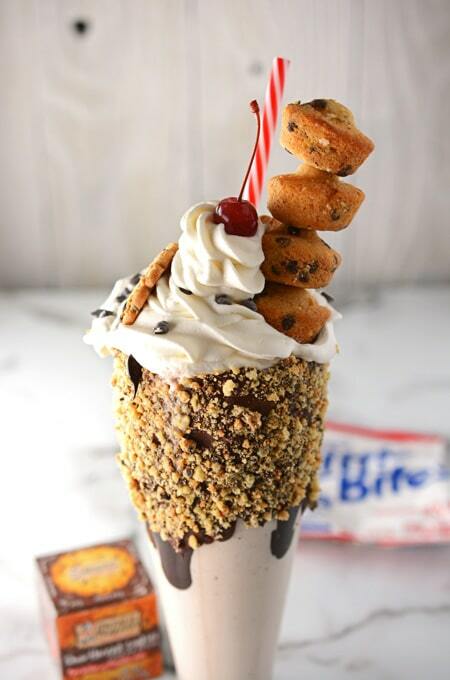 And just a little tip in case gravity is getting the best of your masterpiece, I used a wooden skewer to hold the chocolate chip mini muffins together, and to give it some stability while on top of the Chocolate Chip Monster Milkshake. Don’t forget to subscribe to receive amazing recipes like this one delivered right into your inbox. It’s that easy! Don’t like your inbox cluttered with email? You can always follow me on Facebook, Instagram, Twitter, Pinterest and Yummly. I’ve got another recipe in the works for this Friday. It’s like a milkshake, but with alcohol; just in time for happy hour. Can you guess what it is? Don’t miss it, be sure to subscribe or follow! Want to know more about Degustbox? Click the banner below for more details about this monthly delivery service. Also, note when you purchase through affiliate links you help support The Cake Chica website. Thank you for your support. With a mixer fitted with a whisk attachment, whip the cream on high speed until the cream begins to thicken. Add the sugar and vanilla extract and beat until soft peaks form. Do not over beat or the whipped cream will separate. Store in the refrigerator until ready to use. In a medium saucepan, whisk together cocoa powder and sugar. Stir in malted milk powder and milk and bring to a boil over medium heat, stirring constantly. Reduce the heat to low and simmer for 3 to 5 minutes. Remove from the heat and set aside until ready to use. In a blender, process ice cream and milk until smooth and frothy. Melt ½ cup chocolate chips in a microwave, about 1 ½ to 2 minutes, stirring every30 seconds. Spread melted chocolate on the rim and down the sides of a tall beer glass. Decorate with crushed up Michel et Augustin Shortbread Chocolate Chip Cookies. Drizzle Cocoa Syrup down the inside of the glass. Prepare a piping bag with a large star tip and fill with chilled Whipped Cream. 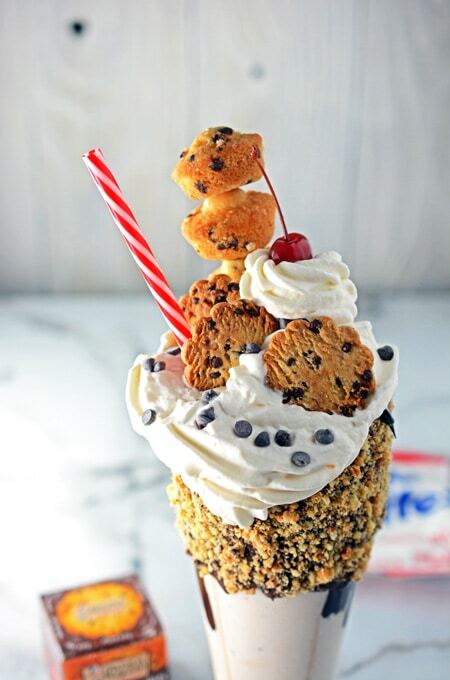 Pour the milkshake in the glass and top with Whipped Cream. 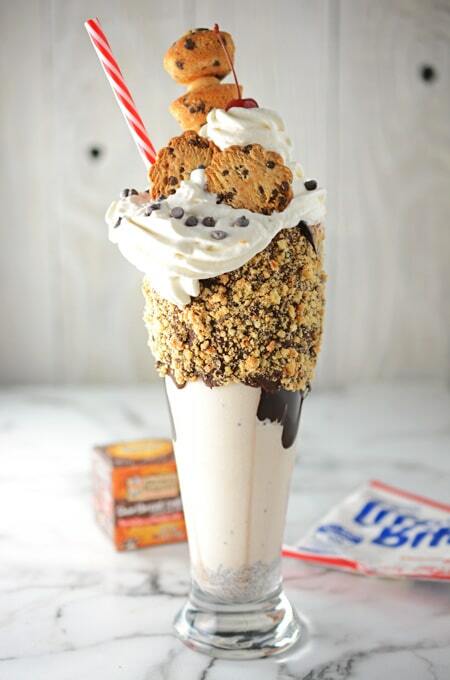 Finally stack your favorite chocolate chip cookie treats on top, creating an out of this world Chocolate Chip Monster Milkshake!